Text by: Kimberly R. Sebold, Ph.D., University of Maine at Presque Isle. Images: Presque Isle Historical Society, Mark and Emily Turner Memorial Library, Prersque Isle Air Museum, Maine Historical Society, Aroostook County Historical and Art Museum. In Northern Aroostook are the three thriving towns of Presque Isle, Caribou and Fort Fairfield, with an average population of about 4000 each and an average valuation crowding well up toward a million dollars. Each one of these towns is well supplied with handsome mercantile blocks, with banks, electric lights, water systems equal to the best, and sewerage systems well under way. Each village has a plentiful supply of church edifices, and a high grade educational institution at which pupils are fitted for any college in the land. And yet there are men now living in each one of these villages who can remember when their sites were covered with the original forest growth, when the river was the only highway and the spotted line the only guide through the wilderness. Wiggin marveled at all that the area, including Presque Isle, had achieved in less than one hundred years. In reflecting on the reasons for development, Wiggins identified five specific events that brought success to Aroostook County and Presque Isle: These events are the creation of roads; the settlement of the boundary dispute between Britain and the United States; the 1838 visit of Ezekiel Holmes, the father of Maine Agriculture; the starch industry; and the railroad; most of these events can be considered as having been driven by the residents of the County themselves. Later in the twentieth century, Presque Isle and the County relied on outside influences such as the military to aid in the continued growth of the region. Pioneers, such as Peter Bull who arrived in 1819, traveled up the Aroostook River from New Brunswick looking for a place to set up a saw mill and lumbering operation. Unfortunately for Bull, the area was disputed territory between the United States and Britain which made it impossible for him to receive title to his land; instead the province of New Brunswick gave him a patent to the land so he could live on it, but he could not sell it or claim ownership. By 1825, surveyors noted that approximately 20 families lived along the Aroostook River and “that they are all somewhat engaged in agriculture, but most of them employ their time principally in lumbering.” They too faced the same dilemma as Bull as the British government withdrew permits given to settle the area until the boundary dispute had been cleared. While the boundary dispute slowed American settlement of the area, the Massachusetts and Maine governments saw the region as theirs and encouraged settlement by offering land grants and mill privileges. The first American, Dennis Fairbanks, settled in the area in 1828 and gained ownership to his land under the provisions set up by the states of Maine and Massachusetts in 1820. Surveyed under the township and range system in 1825, the land that would become Presque Isle and Maysville were Letter F, Range 2 and Letter G, Range 2, respectively. The state of Maine gave grants of land and mill rights if a settler set up a mill, cleared 15 acres—devoting 10 acres to the production of grass---and built a house within four years of settlement. Fairbanks received 640 acres of land on which he built a grist mill and saw mill, plotted half acre lots and planned streets as the foundation for the settlement of Fairbanks Mills. Despite the fact that Fairbanks tried to maintain control over the settling of land in Letter F, other settlers, who acted independently of Fairbanks, arrived so that by 1830 there were approximately 2,000 people in the County. Better land deals that the state of Maine devised in 1835 attracted more settlers; the state sold land at .50 cents an acre and settlers could help build roads for approximately 9 days a year for four years to pay for 100 acres of land; through this method, settlers received relatively inexpensive land and helped to eventually break the isolation of the area. In the pioneer stage which lasted until the 1840s and is characterized by the lack of roads, the economy was based on the lumber industry with the lumber being shipped down the Aroostook River to the St. John River and then back into the United States duty free. The farmers in the area catered to the lumber industry by growing grain, hay and potatoes which were needed for the lumber camps to survive. Many of these farmers also worked as lumbermen during the winter months. By producing goods for the lumber industry, farmers did not have to worry about getting their produce to long-distance markets; however, when the road finally connected Presque Isle to other areas of the state in 1839, the economy shifted towards production of farm goods for long-distance markets. The transformation was not immediate and it would take until the 1890s for the economy to be based on one crop: potatoes. In the meantime, farmers raised sheep and cattle which were driven to Massachusetts for sale at the Brighton market, grew clover seed and grass seed to be shipped downstate, and produced dairy products for the residents of the town and surrounding area. Settlers made and sold cedar shingles as well and some towns accepted the shingles as currency. As early as 1838, authorities were touting the potential of the potato to Aroostook County. In that year, Ezekiel Holmes, editor of the Maine Farmer and later designated father of Maine agriculture, visited Aroostook County and the Presque Isle area and reported back to his readers what he had discovered. His primary concern was the outmigration to the west that was robbing the southern part of the state of its young men; he hoped that by espousing the wonders of the County, young Maine men would go to the northern frontier and stay in Maine as opposed to the western frontier closer to the Mississippi. He claimed that potatoes were the future for the County and said that “when planted in season, are equal in quantity and quality to any…The climate and soil both seem[ed] peculiarly congenial to this root.” His major complaint about the area was its isolation and even though the effort to build roads was ongoing, he did not think it was enough and stated “nothing is wanting but greater facilities for getting them [potatoes] to market.” While workers completed the road that linked Presque Isle to Houlton and then to the southern parts of the state in 1839, potatoes as a mono-crop was not possible until the railroad connected the area to the rest of the state. However, the population numbers that could support the development of the railroad would not come until the boundary dispute was settled and the country, as a whole, passed through the trials and tribulations of Civil War. The boundary dispute between Maine and Great Britain had been an ongoing issue that finally reached its climax with the “bloodless” Aroostook War in 1839. The boundary dispute began with the Treaty of Paris that ended the American Revolution in 1783; the treaty stated that the eastern boundary of the United States was the St. Croix River, but documentation never made clear which river was the St. Croix. The U.S. preferred the easternmost river while the Britain preferred the westernmost one and this left seven thousand square acres of disputed land in Aroostook County. In June 1828, the U.S. government sent peacekeeping troops to Houlton and this initiated the building of the military road between Houlton and Bangor—this same road connected to Presque Isle in 1839. Illegal lumbering and arrests of New Brunswick government officials by the U.S. led to more troops arriving in the area and establishing a blockhouse in Fort Fairfield. In 1842, the dispute ended with the Webster-Ashburton treaty that confirmed the St. John River as the boundary between Maine and New Brunswick. The treaty opened northern Maine for settlement without restriction and exposed approximately three thousand soldiers to the potential of the region. Many of these men either stayed or returned to the area after being discharged from the military. From 1839 to 1859, Presque Isle grew large enough to support a hotel, a school, newspapers, churches, and various stores; moreover the extension of the military road to Presque Isle together with a growing population made it possible for mail to be delivered to the area in 1842. This growth also led to the building of the first bridge over the Aroostook River, the lobbying for a railroad to come to Presque Isle and the petitioning of the legislature for the right to incorporate all in 1858; incorporation as a town was granted the following year. In addition, during this twenty-year time period, settlers pushed into neighboring Letter G creating farms and relying on Presque Isle for all of their goods and services. Eventually, Letter G became known as Maysville and governed itself until it became part of Presque Isle in 1883. By 1860, the County boasted of a population of 22,479 with 1388 of these people living in Presque Isle (formerly Letter F) and Maysville (formerly Letter G) and reports from the area stated that twenty new homes had been built with plans for more to come. The settlement of the boundary, coupled with the writings of Ezekiel Holmes, encouraged both the buildings of roads and the arrival of new settlers so that the last half of the nineteenth century became focused on the modernization of specific towns and their communities and economies. The advent of the railroad, even with its circuitous route and inadequate facilities, gave a new impetus to Aroostook agriculture, as it directed the attention of starch manufacturers to this fertile region, and it was found that the soil was particularly adapted to the raising of potatoes of fine quality and in almost unlimited quantity. Farmers received cash for their crop, paid off their mortgages, improved their farm buildings and their homes and found themselves with more leisure time. The demand for Aroostook potatoes soon extended beyond the starch factories and out-of-state buyers started purchasing them for human consumption. With this increased demand came more intense pressure for a direct railroad line to Presque Isle which was finally achieved with the opening of the Bangor and Aroostook Railroad line to Houlton in 1891 and to Presque Isle and Fort Fairfield in 1894. Clarence Day, author of Agriculture in Maine, 1860 to 1940, stated that the effect of the railroad on the area was immediate: one thousand new farms sprung up between 1890 and 1900; the value of land and buildings increased from 7.5 million dollars to 11 million dollars; and potato acreage jumped from 16,641 acres to 41,953 acres. By 1900, farming in Aroostook County focused on the potato with table stock, seed and starch potatoes as the three most important market outlets. The potato became so important that in 1913 Thomas Phair and other leading Presque Isle businessmen convinced the state legislature to fund the purchase and operation of the Aroostook Farm which was a demonstration farm that experimented in the modern methods of potato production. Economic development led to the growth of infrastructure in Presque Isle. By the end of the nineteenth century, the Presque Isle Fire Department had been incorporated and Presque Isle had its first water company, the Presque Isle Water Company, which built and operated the reservoir at Mantle Lake to supply the town with water and protect it from fire. As the town modernized, its infrastructure included a sewer system, an electric lighting system powered by a plant with two Edison dynamos, a bank, churches of several denominations, various factories including a furniture factory, livery stables, hardware stores, blacksmith shops, schools, post office, telegraph lines and a telephone service. Residents found they could be entertained at opera houses and could become engaged in community activities through various organizations such as the Masons, Odd Fellows, Knights of Pythias, Grand Army of the Republic, Aroostook Rebekah and Olive Branch Encampments, Women’s Christian Temperance Union and the Grange. . Prosperity continued into the first several decades of the twentieth century as the population rose from 3,804 in 1900 to 6,695 in 1930. During this time, the town became home to the Aroostook State Normal School that trained teachers, a public library sponsored by the Andrew Carnegie Foundation, the Aroostook Valley Railroad (an electric railroad that connected residents to nearby towns), the Northern Maine Sanatorium for tuberculosis patients, a public hospital, car dealerships, and the development of Main Street as we know it today. By the end of the 1920s, however, the area residents discovered the problems with a single crop economy. These problems included overproduction, lack of supplemental income in poor years, fluctuations in yields and prices, debt, and foreclosure. Like in other places, the economy went through cycles of boom and bust and the County was not insulated from the effects of the Great Depression. In 1940, some of the prosperity returned to Presque Isle and the County as the U.S. Government chose Presque Isle’s airport as the site for the U.S. Army Air Base; the construction of the Presque Isle Air Base in 1941 kicked off a building boom in the city that lasted into the 1950s. In addition, Presque Isle became Aroostook County’s first city in 1940. World War II and the army air base brought many new people into the area including Clark Gable, movie star and member of the Army Air Force, and Bob Hope, movie star and comedian working with the USO. Many of the servicemen stationed at the air base found that Presque Isle and the surrounding area made a good home for their families and stayed after the war; population rose from 7,939 in 1940 to 9,954 in 1950. 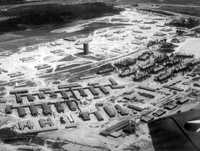 The army’s interest in the air base allowed for the continual rise of population until it peaked in 1960 at 12,886. 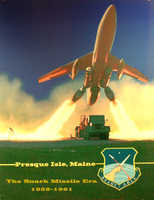 More servicemen came to the area after the war when the Presque Isle Air Force Base received its first SNARK missile. The twenty-year growing trend ended, however, in 1961 when the government closed the Presque Isle Air Force Base. Since the 1970s, Presque Isle has undergone a decline in population due in part to the closing of the air force base and changes in the region’s economy: the 1970 census recorded a population of 11, 452; the 1980 census recorded a population of 11,172; the 1990 census recorded a population of 10,767; and the 2000 census recorded a population of 9,511. Even with such changes, Presque Isle remains an important cultural and economic center for Aroostook County. The Aroostook State Normal School grew into the University of Maine at Presque Isle attracting students from all over the state, region, country and world; movie theaters remain an important part of the entertainment sector; congregations support a variety of churches ranging from Catholic to Congregational to Baptist to Methodist to Jehovah’s Witness; the Northern Maine Fair is still an important rite of summer, WAGM transformed itself from an AM radio station to a television station, and the Aroostook Centre Mall continues to be a shopping center for County and New Brunswick residents. During the 1980s and 1990s, the city’s business center relocated from the downtown area of Main Street to the northern end of Presque Isle as new stores and fast-food restaurants clustered around the Aroostook Centre Mall. In the last decade, however, city leaders have encouraged downtown revitalization that has led to the repopulation of stores with specialty shops, lawyer’s offices and banks. Downtown Main Street maintains its importance in the town as every year it hosts Presque Isle’s Pioneer Days and parades attract spectators from all around the area on the Fourth of July and Christmas. As the most populated city in the area, Presque Isle plays a pivotal role in the lives of the region’s residents and continues to be the HUB of Aroostook County. Clark, Marilyn, et.al. City of Presque Isle 125th Historical Booklet 1859-1984. n.p., 1984. Day, Clarence. Farming in Maine, 1860-1940. Orono, ME: University of Maine Press, 1963. Graves III, Richard A. Forgotten Times: Presque Isle’s First 150 Years. Presque Isle, ME: Northeast Publishing, 2006. Wiggin, Edward. History of Aroostook. Presque Isle, ME: Star Herald Press, 1922. Wiggin, Edward. “The Resources and Future of Aroostook County,” in Thirty-Fifth Annual Report of the Secretary of the Maine Board of Agriculture for the Year 1892. Augusta, ME: Burleigh, Flynt, Printers to the State, 1893.